Skidsteers are a versatile pieces of equipment that can perform extensive types of jobs with the use of attachments. Skid steer loaders are the workhorse of any job site. They are powered by a small engine, have a rigid frame, and the lift arms attach to a host of different tools. Skid loaders come in a wide range of size classes with weight capacity from 1250 lbs for the smallest to over 2700 lbs on the largest. These multi-terrain loaders come with either wheels or treads offering maximum traction. They are ideal for work on rough terrain. These loaders are equipped with a smooth bucket making them ideal for moving soil or loose materials. It's the variety of other attachments that make Skid steer loaders so versatile. Sawtooth buckets are available for digging, auger attachments are perfect for making holes. Concrete breakers get through tough barriers, and grapplers make demolition and clearing work exceptionally easy. 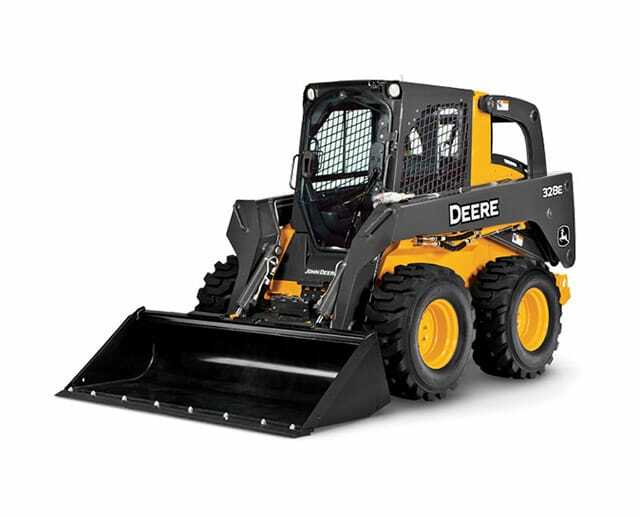 Skid steer loaders are one of the most common types of heavy equipment seen on job sites. Sometimes called Bobcat skid-steer loader, compact wheel loaders, or compact track loaders, they perform a wide range of jobs on or off construction sites. The history of skid steer loaders began with a turkey farmer named Eddie Velo. His business had grown so large, that he started to use two story barns. He went to Keller Loader in 1956 with a problem. Cleaning the manure from the second floors of his barns was becoming a big issue, and standard loader tractors were too heavy to place on the second floor. Keller designed a small one-seat three-wheel loader. The seat was mounted directly above the front axle, and lifter arms were attached on the front of the loader and powered by pulley belt drives. This first mini skid steer loader surpassed expectations. However, the arm system had to be revised because the belts on the pulleys kept slipping. This lead to a patented clutch system. Along with the patented clutch system came an independent drive system for both wheels. This meant that the loader could turn on the spot offering tight maneuverability. Initially, the lifter arms were mounted on the front of skid steer loaders. This provided lifting power, but because most of the weight geared toward the front of the loader, tip-overs were a frequent occurrence. In 1959, Keller partnered with Melroe Manufacturing. The new designs moved the engine and operator seat more toward the back wheel, and also mounted the lift arms on the rear. This boom proved to be able to lift heavier loads because the weight balance prevented tip-overs. 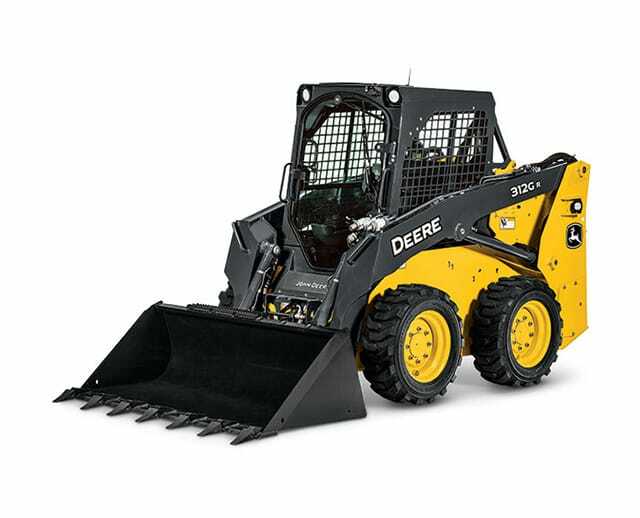 Skid steer loaders are the most widely used piece of equipment on any job site. They perform a huge variety of jobs and have just as huge a variety of patents filed on them. The skid steer loader has been continuously improved on since its inception in 1957, and this looks to continue into the future. One of the most critical recent patents was for a sliding counterbalance system mounted inside the sides of the vehicle. Because of the heavy loads they lift, tip-over can be a problem. The sliding counterbalance system places a 300-pound weight inside the case of each side of the frame. These weights act as a counterbalance and shift with the angle of the vehicle helping to avoid tip-overs. In 1997, a tie-down device for securing cargo bindings was patented. This device includes a housing cavity that can be attached to the bucket by various threaded screws and threaded fasteners. Previous to this type of system, multiple cables and turnbuckle style rigs were commonly used to secure loads for transport. In 1995, an independent power system was devised to allow for skid steer loader attachments to be able to tilt. Before this, the buckets were raised and lowered with the arms but had no additional movement. The tilting breakthrough allows for the buckets to be tilted up and down without extra movement from the loading arms. 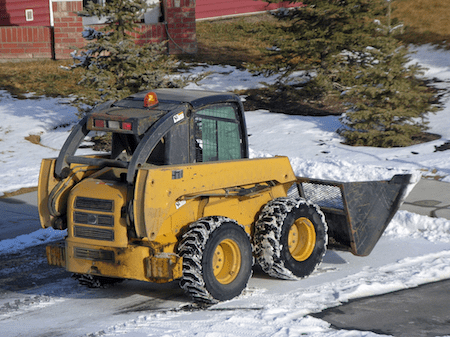 Skidsteers can be purposed towards a wide range of tasks, including snow removal. A skid steer loader is best used when you have something heavy to move. The hydraulic lift arms give the skidsteer loader anywhere from 1250 lbs to over 2700 lbs of lifting capacity. Whether you're working on the farm or a construction site, the skid steer loader helps do the job right. It's the attachments available that make this compact workhorse such a versatile tool. From lifting and digging to dumping, with the right attachments a skid steer loader is a multi-utilitarian machine. Smooth buckets make moving soil or other loose materials faster and easier than moving by hand. This is one of the primary jobs compact track loaders are used for. Sawtooth buckets are perfect for digging into the ground, especially in stonier areas or hard packed soil where shovels would take much more time. These attachments are also called backhoes. These attachments come in many shapes, and all offer a retractable claw for gripping. These are used primarily on construction sites for moving large pieces of debris. Farmers used them for carrying logs, and even pulling stumps. Heavy snow in the north was the motivation for what eventually became the skid steer loader. These attachments make chopping through deep pack snow easy using steel rotating augers. Another popular attachments, these blades are used not just for pushing heavy loads but are perfect for grading the landscape as well. Other popular attachments include concrete breakers, auger drills, mulchers, mowers, tillers, and even vibratory drum rollers. There are very few large tasks that there aren't skid-steer attachments for. 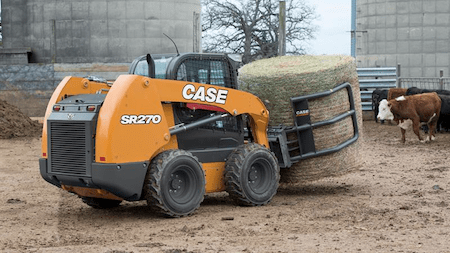 In the world of compact skid steer loaders, there are a few names that stand out above the rest. 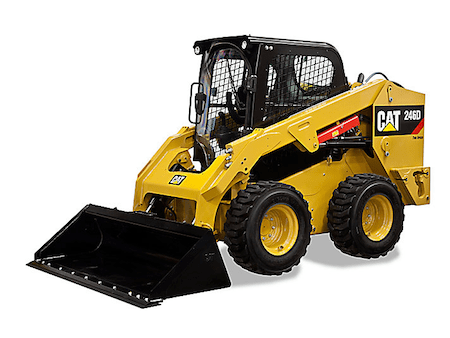 Caterpillar, John Deere, and CASE are constantly at the top of any list of best skid steer loaders. All three brands offer superior quality and performance, but it's the little differences that set them apart from the rest of the pack. Caterpillar has one of the oldest lineages of any company still going today. It began with Benjamin Holt building the first horse-drawn combine harvester in 1886. The company steadily evolved, building the first steam-powered tractor in 1890, gas-powered tractors and combines in the 1910s and 1920s. Through the 30s and 40s, they build graders, cranes, and earth movers for large construction, all the way up to the groundbreaking innovations they are making today. Their modern wheel and track loaders are powerful, boasting 65-75 horsepower engines and operating weights of up to 10,000 lbs. John Deere has a history almost as deep as Caterpillar. They started in 1918 with their first gas-powered farm tractor. Over the years, their primary focus was making their tractors as versatile as possible. They developed numerous attachments like tillers and combine harvesters to make their tractors an all-in-one farm tool. John Deere has always been about versatility, and in the 1970s, branched out into other types of heavy equipment like dozers and skid steer loaders. 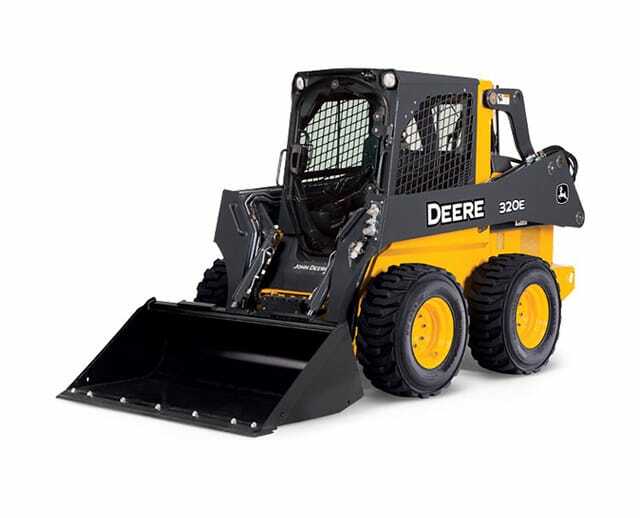 Their wheel and track loaders offer weight capacity of up to 3600 lbs and high 100 hp engines. CASE equipment has been around for 175 years. They started when J.I. Case began to innovate with steam-powered engines. Over the years, the company switched its focus to pioneering equipment for road construction because of the great highway projects in the 1930s and 50s. CASE has consistently put out products that are not only powerful but long lasting as well. They offer a wide range of attachments to handle any job you need. As with the brands, each has their popular models. These models are used the most often for various reasons. A perfect blend of power and efficiency. Offering a 73.7 horsepower engine, 195 foot-pounds of torque, and an operating capacity of 2400 lbs this beast can get done what you need to get done. 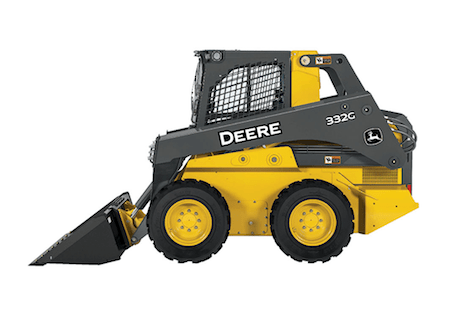 The 246D compact wheel loader offers a sealed pressurized cab for a quieter and cleaner operator experience. Advanced displays maximize capability and control as well as a rearview camera. CAT Intelligent Leveling gives industry standard balance protection with features like dual detection self-level, auto work tool return positioners, and speed sensitive ride controls. Like everything Deere does, this compact wheel loader is built for versatility. The 332G sports a 100-horsepower engine and operating weight capacity of 3600 lbs. If it's in your way, this loader will move it. The cab is all about efficiency with larger entryways and swingout door making it easier to get in and out. Three-way switchable controls offer EH foot, ISO joystick, or H-pattern joystick models. You can control your loader anyway you want. Deere also offers a 90-inch bucket for maximum efficiency. CASE has been making heavy equipment for a long time, and it shows in the SR270. It comes standard with a 90-horsepower engine that gets a fantastic 282 foot-pound of torque. The operating weight capacity is at 2700 lbs giving a great balance of power and efficiency. The cab is fully enclosed with heat and AC along with dust filters to provide a cleaner and quieter workday. The larger cab and rounded rear window offer a 360-degree view allowing for greater visibility. While controller styles may be similar, their functions can be very different. Bobcat has recently begun a transition away from foot controls and toward joystick operation because it offers more subtly of movement. Bobcat also began offering radio remote control for instances where operators would instead work from outside the machine. Caterpillar has redesigned their controller patterns to better integrate foot pedals along with joystick advances to custom tailor operation to the driver. The current trend in innovation is more focused on the operators as opposed to the machines. While the equipment is always improving, manufacturers are working now to make the best operator experience possible. 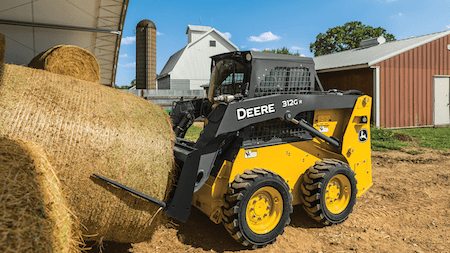 The track and wheel loaders market has settled over the years on some features and accessories that should come with every loader. With every company seemingly offering so many different options and features, it can seem like all loaders are created equal. It's the little details that make all of the difference though and will help you find the best machine for your needs. There are a few things that most loaders have in common. For example, EPA Tier 4 standards were put in place to regulate older models and bring them into current standards. Most skid steer loaders were expected to comply by 2015. Cab size and configuration is another example of very similar design. Cabs are bigger, quieter and cleaner. Controls are another example of standardization. While there are differences, control configurations like pedals, levers, and joysticks are similar. With any piece of heavy equipment, there can be dangers if the machine is not operated correctly and safety protocols are not followed. There are many safety systems in place, but accidents can still happen. 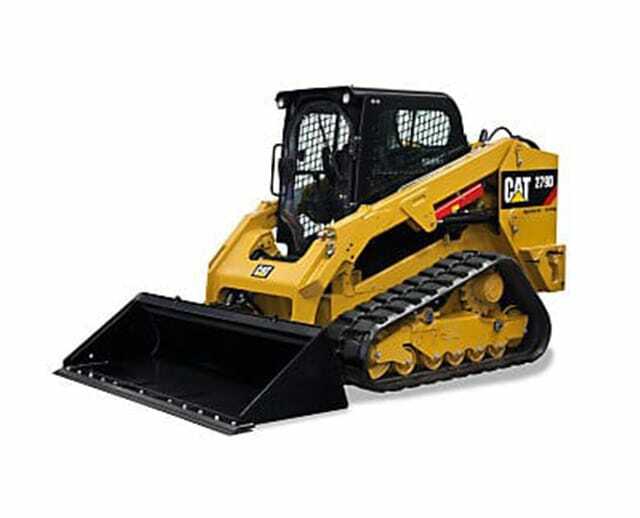 The most common causes of accidents and fatalities with skid steer loaders involve crushing incidents, rollovers, pinning in between the vehicle and other objects, and being run over. Many of these incidents come in two forms. Workers are either crushed while working or standing under a raised bucket. Or, operators are crushed by falling objects. For the most part, the safety cages around the cabin will prevent fatalities from falling objects; operators should still be mindful of driving under areas where heavy material can fall. For the second type of accident, workers should never work or stand under a raised bucket. Because they lift heavy loads, there is always a chance that loads can shift and the vehicle can tip over forward. Operators can prevent these by never attempting to lift loads that are over their maximum capacity. Sideways rollovers come from working on uneven ground or steep grades. While braking systems can help here, never operate on grades that are more than your vehicle can handle. These types of accidents happen when safety protocols are not followed. Workers should not work around machines while the arms are moving, or attempt to fix or mount the vehicle while the arms are moving. Operators must also take care when turning loaders, as peripheral visibility can be reduced at times. Run over accidents are caused by inattentiveness. Workers should be observant of all vehicles around them, and never attempt to work in areas where vehicles are moving. Operators need to be aware of their surroundings. Never move the vehicle without checking in all directions and giving a signal before turning or backing up. Safety is the primary goal when operating any piece of equipment. The most important part of any safety protocol on any job site is proper training. 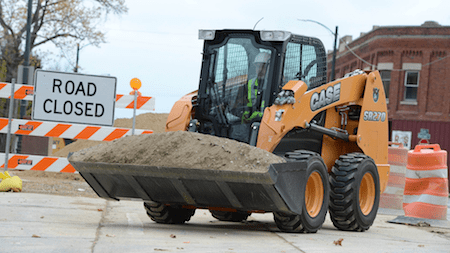 Skid steer loaders are one of the most widely used vehicles on job sites, and so following appropriate safety protocols is vital to preventing accidents. 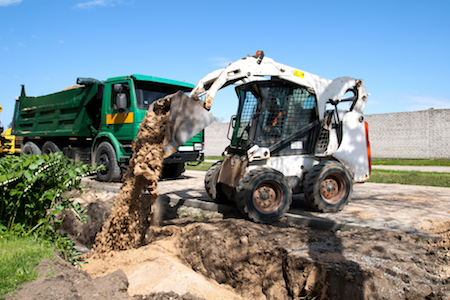 Most vehicles are equipped with a host of safety features, so operator attentiveness to the job site is one of the most significant factors in keeping everyone safe. Falling Object Cages – The cabin is surrounded by a steel frame with cages to prevent accidents from falling objects. This cage is also meant to protect the operator in the event of tip-overs. Side Cages – Additional steel meshes exists between the lift arms and the operator cabin. These prevent the operator from extending arms or tools into the path of moving arms. Interlocking Controls – The controls in the cabins of most loaders lock into place at the operator's lap, and only if they are correctly seated. In most models, the vehicle will not move without the controls being locked. Safety Belts – One of the simplest safety protocols. These belts prevent the operator from being ejected from the cabin, and from being jarred around during tip-overs. It is imperative that none of these safety systems be overridden and operators should never operate a machine where these systems are not working. Safety systems are just the first step to safe operation. Operators need to be aware of their surroundings at all times. Give signals to other workers when backing up or turning the vehicle, and always be mindful of what is around the vehicle when raising or lowering the bucket. To be operated safely, a skid steer loader needs to be stable. If the center of gravity goes too far off center, the danger of tip-overs becomes exponentially higher. Operators should keep their bucket as low as possible when going uphill or downhill. Never attempt to lift loads over their weight capacity. Operators should never try to lift loads without all four wheels being level. Proper training is the key to any safe job site. Properly trained operators are not only safer but also more productive because they cause fewer accidents. There are a few more things to consider regarding training your workers. Allowing untrained operators to use equipment can void your insurance policy. In the event of an accident, if the operator in question is found not to have received the proper training insurance companies can legally refuse claims. Untrained operators can have your bonds revoked. In every state, it's a requirement that heavy machine operators undergo training. Most states take this a step farther and require formalized testing done through the state or the occupational health and safety administration. Failure to abide by these regulations can garner fines and the revocation of professional licenses. Many choose to rent rather than to buy heavy equipment. If you are found to be using untrained operators, however, the rental agreement is null and void. You can be assessed for any wear and tear on the equipment, and sued by the rental company as well. Properly trained operators cause fewer accidents overall and cause less wear and tear on the vehicles. Accidents are expensive. Apart from possible lawsuits, and increased insurance premiums, they cause delays to the work which increase costs exponentially. Properly trained operators also know how to use their vehicles which will likely cause less damage to the equipment. What kinds of safety equipment are needed for operations of the loader? Hard hats are required as well as safety goggles. For additional equipment, stress that the operations manual is available on the client's website. 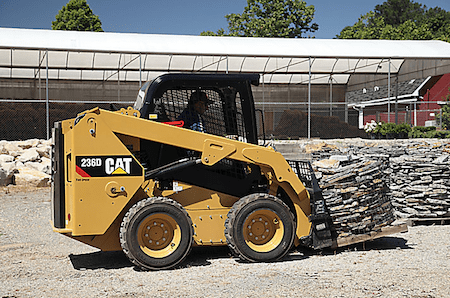 What kind of training is necessary before operating a skid steer loader? OSHA requires skid steer loader operators to undergo the same training as powered industrial truck operators, as well as receiving refresher training by the employer on their specific equipment. The price listed doesn't include the pickup and delivery charges. Also, keep in mind that there are required state taxes too. The prices listed are based on your major metro areas. Please check our site and enter your ZIP code to see your areas price range. If you have further questions, please call us at (888) 325-5172. A skid steer loader is one of the most versatile and commonly used pieces of equipment. They offer ease of controls and a wide variety of attachments. They are the perfect tool for a wide range of heavy jobs. As with any heavy equipment, there are safety precautions that need to be observed to prevent accidents. Check out BigRentz.com and speak with a rental coordinator today.